The Papillon dog breed is a very small, fluffy-haired toy spaniel that’s been known by many names through history. It’s mostly white, with splotches of others colors and a long, plume-like tail that curls back towards the head. As a result of this tail, it was once known as the “squirrel spaniel“. 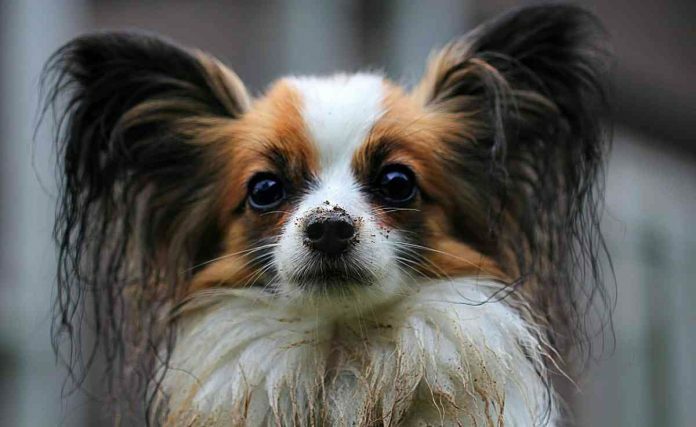 Due to its large ears shaped like butterfly wings, the Papillon has also been called the butterfly dog in the past. No matter what it’s called, this small dog breed has become very well-loved among toy dog lovers. During medieval times the Papillon dog breed was also known as the Continental Toy Spaniel. It’s one of the oldest breeds of dogs. Its recorded history in Europe goes back almost seven hundred years. The breed was named the dwarf spaniel at first, and it originated in Italy. It became very popular there during the Renaissance and can be seen in many of the paintings from that period. French breeders later adopted the spaniel and they developed the characteristics that can be seen today, most notably the large, sharply pointed ears. Papillons are less than a foot tall and they only weigh between seven to ten pounds. Their hair is long and silky, and it should be brushed daily. The Papillon dog breed is not a heavy shedding breed. The muzzle is short and pointed. Papillions have a generally friendly temperament and are very affectionate with their owners. They love to play and run outdoors, but are not always friendly towards other dogs. Older children make good companions, but younger kids can sometimes irritate them and get on their nerves. Some Papillions can be nervous and shy, and can sometimes be prone to barking excessively. They are protective of their owners and will sometimes act aggressively towards strangers that they perceive to be a threat. The Papillon dog breed is quite smart and usually easy to train, though house training them can sometimes be a challenge. For the most part though, they are good indoor dogs. However, keeping them in apartments can be a mistake, as they often bark at noises they hear outside or in nearby apartments. This is due to their driving instinct to protect property and family. Papillions need regular exercise, but are small enough that they do not need to be taken outside every day. They will usually get along with cats, as long as they have been raised with them around. Their teeth do tend to amass tartar, so it is important that you brush them on a regular basis. A couple of other health concerns for the Papillon dog breed that you should be aware of are that they can be prone to knee problems, and some dogs have a soft spot on the top of their head like a human baby’s that needs to be protected.